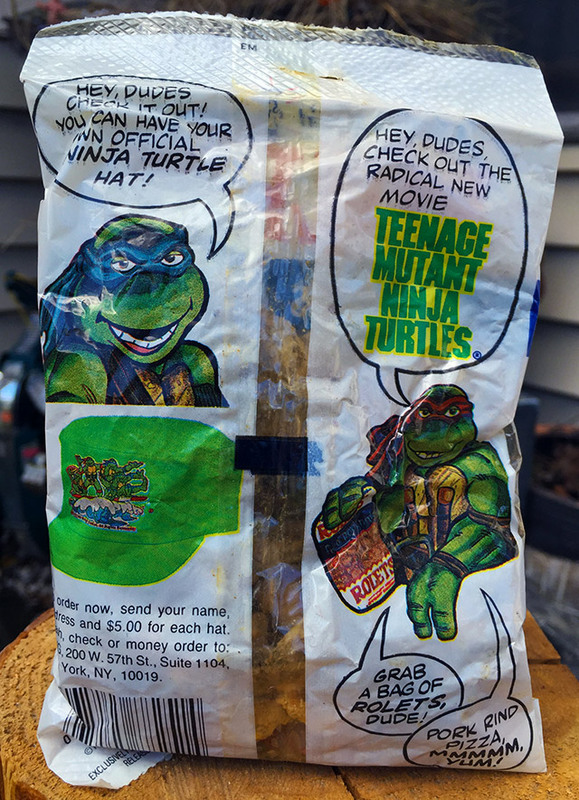 TMNT Pork Rinds from 1990?! | Dinosaur Dracula! I spent $100 on Ninja Turtles pork rinds. Actually, with shipping, I spent $104. 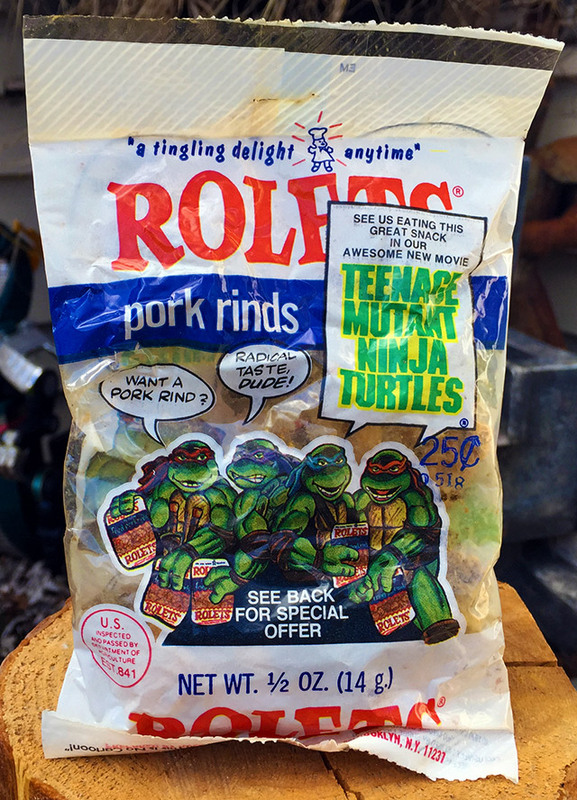 Distributed by Rolets in 1990, the pork rinds were meant to promote the first Ninja Turtles movie. (First and still the best, IMO.) While something pizza-related was obviously a more natural fit — and the Ninja Turtles did indeed team up with several pizza makers — there was an in-universe reason for this pork rinds promotion. More on that in a minute. The decision to buy these didn’t come easily. I even ran a poll on Twitter, secretly hoping for strangers to talk me out of it, but knowing deep down that I was still gonna get these motherfuckers no matter what people said. For one thing, I’d been chasing them for years. Very long ago, a “retired” TMNT collector tossed his whole collection on eBay. 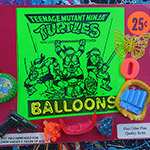 It was 90% action figures and other stuff from Playmates’ toy line, but barely visible in a pile of side dish ephemera was one beautiful bag of Ninja Turtles pork rinds. This was the first time I’d seen a still-sealed bag of ‘em since. I routinely resist the many hot new collectibles that all of my friends go wild for, but when I honestly feel like I’ll never have the chance to buy something again, my resolve dies and my entire body is taken over by tiny-sized idiot versions of me, who all shout “YOLO” in unison, sounding like evil chipmunks. You’ve seen this behavior on display all over Dino Drac, which might’ve led you to believe that I really am flush enough to be able to afford literal garbage. Not true at all. With each of these purchases comes a huge pile of guilt. I then force myself to sell enough of my older collectibles so that the new thing could technically be construed as “free.” It’s like going to a pawn shop after a bender in Atlantic City. It’s exactly like that. As strange as the partnership sounds, it made sense. 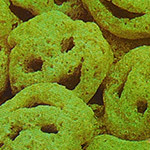 Rolets pork rinds actually appeared in the Ninja Turtles movie. During a key scene, Mikey shares a bag with Don to drown out Leo and Raph’s big argument in the next room. It was one of the film’s many brilliant scenes that developed the Ninja Turtles as individual characters with stark differences. Trust me, nobody picked their favorite Ninja Turtle just based on his bandana color. There was a lot in play. Sadly, Rolets didn’t go all-in with pizza-flavored pork rinds. If I’m being honest, these are less “Ninja Turtles pork rinds” and more “regular pork rinds with Ninja Turtles on the bag.” But I’m only saying that so that you can’t say it first. If I’m going to eat a hard truth, I’m going to pick the time. The rinds themselves are putrid. They’re twenty-five years old, after all. Shriveled and green, they look like the fossils of sneezes. God knows how they smell. I never knew about this promotion as a kid, probably because I grew up thinking that “pork rinds” were just a thing made up for television sitcoms. 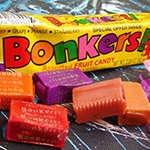 I’m not sure I understood that they were real snacks that existed in the real world. Dan Conner sure seemed to like them, but Dan Conner also owned cans of corn that were way too big not to be props. I didn’t know who to trust. So while I can’t say that I have neck-deep nostalgia for this bag, it’s still a reminder of a time when TMNT was my everything. 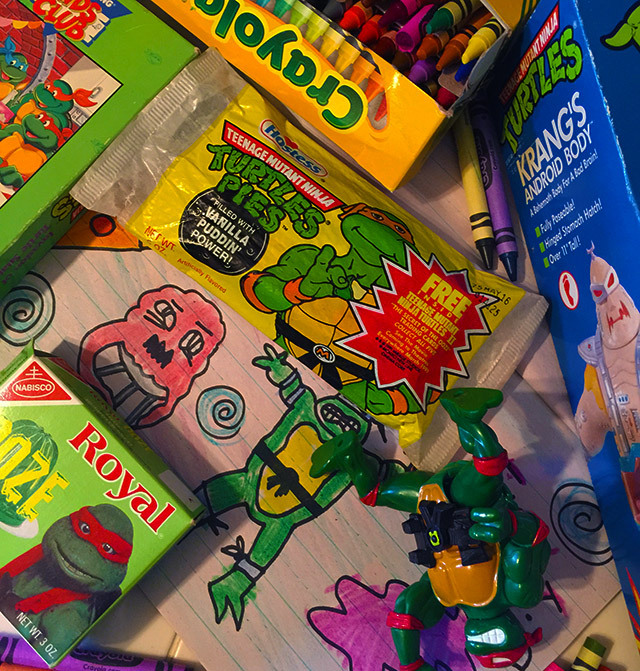 You look at that glut of Ninja Turtles junk — an extremely small sampling of its entirety — and you might think, “no big deal.” These days, every big movie or kid-targeted thing gets the same treatment, with the full complement of toys, foods, clothes and comics. There’s a difference, though. With today’s crops, 50% of the purpose always seems to be “increased awareness.” It’s marketing through and through. Bad movies that nobody ends up caring about travel the same red carpet. It’s routine. Back then, the Ninja Turtles really were that popular. Their faces appeared on everything because we would buy anything that had their faces on it. This was a special time for me. I was young enough to be a kid, yet old enough to truly grasp the concept of collecting to the point of excess. 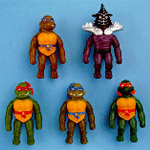 Empty lives will grab at even the worst fuels, and for me, as a kid living in pre-internet times with few friends and none of the needed coordination to make new ones, getting more Ninja Turtles junk was that fuel. The hunt consumed me because it had no competition. It was either that or homework. Come on. I wonder how often that happens in 2016. Whenever I see a kid embrace one single franchise in a “this is my life and nothing else matters” sort of way, I’m impressed. Honestly, it seems hard to do. There’s so much out there. Attention spans seem to grow shorter by the minute. We live in a society that increasingly encourages it. Kudos, theoretical children. I couldn’t even finish this article without playing five rounds of Juice Jam. 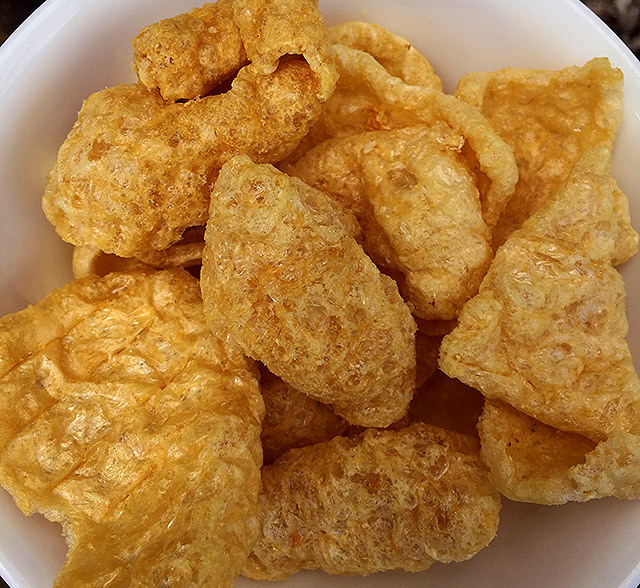 Oh, and here’s a bowl of fresh pork rinds, which I specifically bought for this article. If you’d never seen them before, well, now you have. It’s a bit like eating packing peanuts that smell vaguely like TetraMin fish flakes, but weirder because you know it’s pork. I feel like my ages-ago thing with the Ninja Turtles is a lost art. If “obsession” is a resource, it’s a finite one. It’s why I run with the ball whenever something like my Cloverfield infatuation happens. Now that feeling is rare. I don’t know how healthy it is, but it tastes so goddamned good. Thank you for reading this, because writing it helped me to understand why I bought this dumb bag in the first place. It wasn’t to be “1 of the 20,” or even simply because the idea of TMNT pork rinds is hilarious. I bought it because even the memory of absolute passion was worth $100. You reach a certain age, and that’s not yours anymore. If it is, it probably means you’re paying too little attention to too many other things. So welcome to the club, TMNT pork rinds. You’ll be another shoulder to lean on when I’m about to blow my top and need to feel like I’m 10 for a minute.